Working out does not always have to include a gym, an instructor or a jogging track; sometimes all you have to do is set your mind to it, and you can even turn your housework into a workout. As anyone would testify, household chores are not easy—they are laborious and strenuous, which is exactly why they can help you burn a lot of calories if done right. According to Dr. Mike Clark of Sharecare Fitness, housework can help you burn almost 100 to 300 calories per hour, depending on your age, weight, and exertion in cleaning. 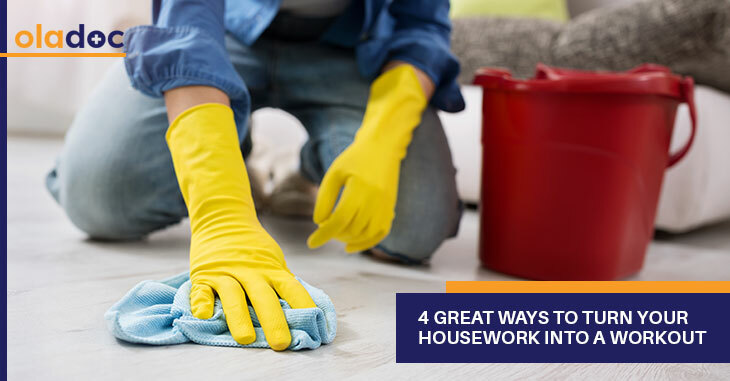 So read on to find how you can stay fit while doing boring household chores! Scrubbing the floor is an excellent task for working the core muscles. It can effectively burn about the same number of calories as 45 minutes of dancing. While scrubbing the floor, keep the strokes firm and long to efficiently work the muscles of the chest and shoulders. However, be sure to balance both the arms so that you evenly train your right and left sides. To burn even more calories, try squatting instead of bending, so both your core and leg muscles get a good work out. Ever thought about lunging when vacuuming? Well, now is the perfect time to implement lunging when vacuuming. Place one foot forward while pushing your vacuum forward, and from there bend your legs and create a 90-degree angle while lowering your body. Hold this position for a few seconds and come back up. Keep your back straight while doing this, and be sure to repeat the movement with both the legs. This exercise (and household chore) will help strengthen your back muscles and the gluteus muscles. If you have to clean multiple floors in your house, then try to tackle the upstairs and downstairs on the same day to reap maximum workout benefits. Using the stairs will elevate the heart rate, workout the leg and thigh muscles and burn more calories. If you are carrying stuff while you move up or down the stairs then it’s even better, because the added weight will provide weight resistance and develop muscles. Try incorporating multiple trips up and down the stairs when you are cleaning your house to make this more effective. Mowing can be turned into a great cardio workout if you want. It can effectively increase the heart rate and work for multiple muscle groups simultaneously. You can also add a power walk to the gardening routine to increase the intensity of the workout. Moreover, if you add ankle or wrist weights, this can add weight resistance to your workout and develop your muscles in no time. In conclusion, even though housework is not the same as walking 5 miles a day, it is still a great way to keep your body in shape without hitting the gym. It is a creative way to work the body and deal with domestic tasks at the same time. If you want additional help in losing weight and attaining a healthy body, then you can seek help from an expert at oladoc.com. Book an appointment with a top nutritionist in Lahore, Karachi and Islamabad through oladoc.com, or call our helpline at 042-3890-0939 for assistance to find the RIGHT professional for your concerns.